PHNOM PENH, Cambodia - Chum Mey finishes his gruesome tale of torture at Pol Pot's legendary prison, Tuol Sleng, where for 12 days and nights he was beaten and his toenails were pulled from their roots. Then he leans over a table, listening intently, while Prak Khan describes working three shifts, every day, as an "interrogator" at the prison. "We would beat them hard," Prak said, "and torture them if they did not give us the answers. When we whipped them hard and they were bleeding, they gave an answer we want." That these two men - victim and perpetrator - could sit together without animosity would seem extraordinary, except in Cambodia, where nearly every person older than 30 was either part of the Khmer Rouge revolution or someone harmed by it. The two groups have been living side by side since a Vietnamese invasion ousted the radical Communist regime of Pol Pot, known as Brother No. 1, in 1979. Many here cling to a Buddhist ethos that says retribution only begets retribution. "If a dog bites you, you don't bite back," Chum Mey said. "If we carried out revenge against one another, there wouldn't be any Cambodians left on the planet." Despite this forgiving attitude, Chum Mey longs for some form of justice - for himself and the estimated two million people who were killed or who died of starvation during the four years of the Khmer Rouge regime. Until now, not a single person has been tried for one of the 20th century's worst genocides. No credible explanation has been given for why - in the name of creating an agrarian utopia - the Khmer Rouge emptied cities, turned the country into a slave camp, and slaughtered so many people. The country's best shot at justice may come from a joint United Nations-Cambodian tribunal, which began its work in the fall after years of delays. International prosecutors and judges arrived in September at a modern courthouse constructed on the edge of Phnom Penh. Defendants may be named in the coming months, and the trial is to begin in the summer. The tribunal could be closely watched by Philadelphia's Cambodians. With 14,000 to 18,000 members, the community is considered the fourth-largest settlement of Cambodians in the country. "The majority of us are first-generation, and we have a lot of connections to Cambodia," said Rorng Sorn, director of programs at the Cambodian Association of Greater Philadelphia. "Those of us 25 or older, we still have the effects. . . . We still have those things in our minds that we have to carry every day." Sorn's family were "typical farmers," and fled to the refugee camps in Thailand. Kim Hort Ou, another leader of Philadelphia's Cambodian community, said the "most informed" people would pay attention to the tribunal. But, he said, because of Cambodia's legendary corruption, "we have mixed feelings about it." "Normally, when you have something like this, you hope to get justice," he said. "I don't know how anyone can find justice in that environment." Although the Khmer Rouge were deposed in 1979, their fighters waged a guerrilla war until the late 1990s. Violence continued for several more years as political parties fought for control. Only recently has Cambodia been considered stable enough to stage a war-crimes tribunal. But after so many years of waiting, skepticism about the tribunal runs deep. Some people find the idea of senior Khmer Rouge leaders sitting in the docks to be unfathomable. And even tribunal supporters wonder how effective it will be in healing this broken nation. "When you talk about the trial, there are still questions about 'Are you going to try the man who killed my father and still lives in the village?' " said Reach Sambath, a press officer for the tribunal. Tribunal officials have said they plan to prosecute only the Khmer Rouge leaders who were "the most responsible" for the genocide. Those would surely include Nuon Chea, known as Brother No. 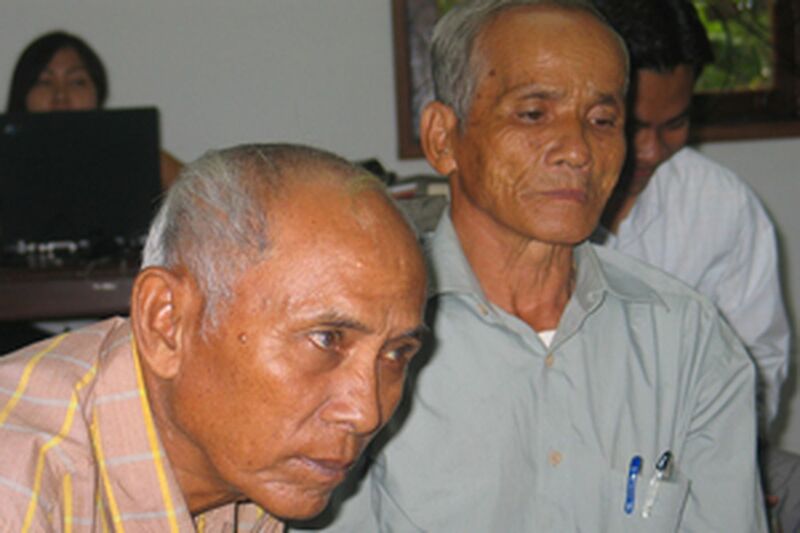 2, and Kang Kek Ieu, who ran Tuol Sleng and is the only Khmer Rouge leader in custody. The rest of the potential defendants have been living openly - some of them handsomely - throughout the country. Other Khmer Rouge figures remain prominent in the government. In 1996, King Norodom Sihanouk gave a royal pardon to Ieng Sary, the Khmer Rouge foreign minister. And Prime Minister Hun Sen was a midlevel member of the Khmer Rouge, although he defected in 1977 and joined the Vietnamese invasion. Nuon Chea, 80, last month told the Phnom Penh Post, an English-language newspaper, that any documents linking him to Khmer Rouge crimes "were manipulated." "Why should we have killed our own people? I do not see a reason," the paper quoted him as saying. "We wanted a clean, illuminating and peaceful regime." Tribunal officials acknowledge that there is widespread skepticism throughout the country that may abate only after defendants are named, arrested, and imprisoned in the detention center being built at the courthouse. But so far, prosecutors have refused to hint at potential defendants. "People often don't like to be placed into custody," said Bill Smith, a deputy prosecutor, "so publicly announcing when you are going to do something, or who you're going to do it to, isn't a good idea." The surviving Khmer Rouge leaders are old and said to be in failing health, giving the tribunal a special urgency. Pol Pot died in the jungle in 1998, never prosecuted, and military commander Ta Mok, known as "The Butcher," died in prison last summer. "If they are left to die naturally," Prak Khan said, "they will escape justice." Many people here also fear that the government will meddle with the trials because, they believe, ties between Hun Sen and the Khmer Rouge remain. Hun Sen has backed the tribunal publicly, but in December, Human Rights Watch blamed him for a disagreement between Cambodian and international judges, who were supposed to set rules for the court. Human Rights Watch said the Cambodian judges were under government orders to obstruct the process and delay the prosecutions. A few weeks later, Hun Sen deflected questions about the tribunal, saying Cambodia had already reached a "national reconciliation." Cambodian Minister of Information Khieu Kanharith called the accusations against the prime minister "politically motivated." In the fall, he vowed that the government would not interfere in its workings. "Many people ask us who will stand trial. That is why we have the judges. It's not up to the politicians," Khieu said in an interview. "The government cannot give amnesty to anyone." From Philadelphia, the view of Hun Sen's role in the tribunal isn't optimistic. "His hand is everywhere. He tries to delay," Hort Ou said. "He doesn't want to see the can of worms opened. . . . We feel helpless, hopeless. The international community complains about Hun Sen . . . but keeps awarding him money." While the Khmer Rouge leaders have gone unpunished, the artifacts of their crimes have become poignant attractions for Western tourists. Toul Sleng, a former school where 14,000 Cambodians were imprisoned, tortured and killed, has been turned into a museum. At Cheung Ek, the main killing field outside the capital, visitors can view the 8,000 skulls unearthed from mass graves and stacked inside a three-story temple. But for many younger Cambodians, born after the Khmer Rouge horrors, the genocide can seem mysterious and unreal. Only now are school textbooks including information on the Khmer Rouge. On the day the regime took control of the country in 1975, Reach Sambath, then 10, watched a soldier arrest his father, who was never to be seen again. Reach said his three children recently asked about the Khmer Rouge - but only because they heard about the tribunal on television and radio broadcasts. Any seeming lack of interest among Cambodians is not due to a lack of evidence. The Documentation Center of Cambodia, founded by Yale University and run by Youk Chhang, a Cambodian American, has interviewed 24,000 victims and perpetrators. Much of the evidence gathered at the center will be used in the tribunal. The center also has brought together victims and perpetrators, like Chum Mey and Prak Khan. Of the seven survivors of Tuol Sleng, Chum Mey is one of three remaining. Prak Khan is one of two interrogators alive. Chum Mey survived because he was a skilled mechanic. Another survivor, Bou Meng, was spared because he was an artist who could render Pol Pot perfectly. He, too, seeks justice from the tribunal, not revenge against the rank-and-file soldiers like Prak Khan. "They had to do their jobs or they would have been tortured," Bou Meng said. "We were all victims." Like many Cambodians, Bou Meng believes that allowing the Khmer Rouge leaders to go free for so long has contributed to the country's sense of lawlessness. If mass murder goes unpunished, the feeling goes, why should ordinary laws be obeyed? "We hope," Bou Meng said, that the tribunal "will bring the culture of impunity in Cambodia to an end."